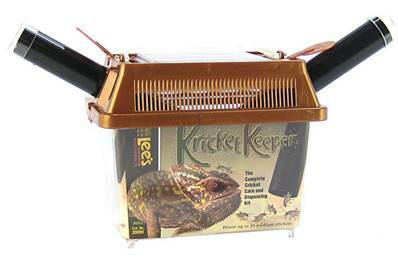 Gut loading livefood is a great way to boost the nutritional value of bugs and the Komodo Kricket Keeper is a perfect receptacle for this. Hide tubes provide necessary perching and shelter for crickets and locusts and makes easy work of collecting bugs to serve to reptiles. Specifically designed for carrying and keeping crickets for a period of time Features a viewing/feeding window on the top The Kricket Keeper comes with hiding tubes which are rough internally and allow the nocturnal insects a place to hide during daytime. This enables the keeper to trap the insects easily in the tubes for easy feeding with the aid of caps to avoid escapees.